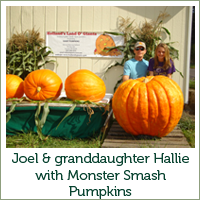 These are new stunningly gorgeous, colossal pumpkins. These bright orange beauties can weigh 50 to 300 pounds, depending on how many you leave on the plant. 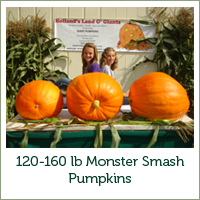 MONSTER SMASH is breathtakingly beautiful with a round shape and well defined ribs. 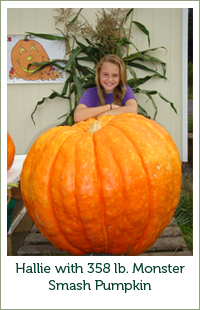 This just released variety will be the “Super Star” of any Halloween display. Seeds are treated with Captan to insure maximum germination. 6 seeds per packet. *PRICES QUOTED ARE FOR SHIPPING IN THE U.S.: Unless otherwise noted, all prices quoted includes shipping in the U.S. only. SHIPPING TO CANADA AND OVERSEAS: PLEASE CONTACT US FOR RATES. Copyright Holland’s Land O’Giants © 2017-2018.